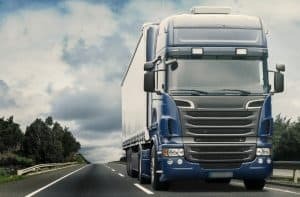 Haulage firms have been given an added incentive to operate greener vehicles after the government announced that the cleanest lorries will pay less to use UK roads. From February 2019, lorries meeting the latest Euro VI emissions standards will benefit from a 10 per cent reduction in the cost of the Heavy Goods Vehicle (HGV) levy. The cleanest lorries pump out 80 per cent less nitrogen emissions than their non-Euro VI counterparts and lorries that do not meet the latest emissions standards will be expected to pay 20 per cent more. This means that the current rate of £1,000 will be lowered to £900 for Euro VI lorries from February 2019. On the flip side, Euro 0 to V HGVs will be subject to a levy of £1,200. Roads minister Jesse Norman stressed that the government is committed to improving air quality and “delivering a green revolution in transport”. “Heavy goods vehicles account for around a fifth of harmful nitrogen oxide emissions from road transport, but they only travel five per cent of the total miles,” he commented. The HGV levy was introduced in 2014 to cover the greater wear and tear caused by lorries to road surfaces, compared to other vehicles.